The flavor of the bread is very good but the texture is too dense. The crust also was almost too thick to eat. The pizza dough had a tendency to form bubbles when I made it. It also was hard to get it crisp without burning it. I love chicken livers. Like totally love. 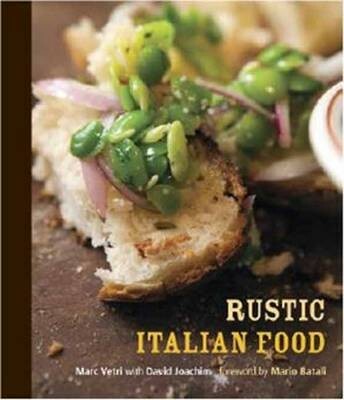 I have had this recipe at Vetri's Osteria in Philadelphia and also made it at home. Somehow I continually find it lacking, both at home and at Osteria, in *something*. It's just not liver-y enough for my tastes (and I did prepare it at home with my own extruded pasta, and more chicken liver than called for), I just feel it needs something else to give it more depth of flavor. As with many of Vetri's recipes I've tried so far, there seems to be something lost or missing in the translation of this dish from the restaurant to the home kitchen. I followed it to the letter and it came out with a delicious flavor to the duck meat, but extremely watery and oily from all of the fatback used and water added. I had to first chill the sauce to let the fat congeal on top, so I could remove it, and then strain out some of the watery "broth", and reduce it further uncovered, before serving. If I make this again (which is questionable, despite the rich flavor), I would use less fatback, less water, and cook it at least partly uncovered so that it can reduce and thicken as when I make meat-based bolognese sauces. I wanted to like this recipe, and I did, but the overwhelming taste and smell of the porcini béchamel made it impossible to enjoy. The taste was good, but too strong. Would make this again, but would alter the béchamel. I did not make the semolina gnocchi as I wanted the standard potato ones, but the oxtail ragu was excellent. Will make this again, but would still use potato gnocchi. The semolina gnocchi are excellent. They would be very good topped with a simple marinara sauce. The oxtail ragu is also good but could be replaced with another sauce to good effect. I was unable to pipe out the gundi into balls. Instead, I had to cut them with a knife similar to what is done with Parisanne gnocchi. Half a recipe served two for a light dinner. I assume that the number served is for a first course. These tasted like gelled strawberry jam. Per suggestions in the book, I added several soaked wood chips to the charcoal in the grill which gave the chicken a nice hint of smokiness. Also, with the large amount of olive oil that the chicken is marinated in, there is a high likely old of a lot of flare ups when it's first put on the grill. I had to turn it several times as well as finish it over indirect heat to prevent the chicken from burning. This was a lot of work and it turned out quite nicely. However, I didn't like it anymore than a regular creamed corn that's a lot easier. The fries were crisp on the outside but very soft on the inside. The flavor of the fries is mostly a generic "fried flavor." Incredibly easy and delicious! The fries come out nice and crispy, lots of flavor...I will definitely make these in the future as a nice alternative to typical french fries. Why have I never made these before? Probably the thought of the oven being on for 5-6 hours. But they cook at a very low temp and the end result is fantastic. My tomatoes from my local farmstand were good anyway but these were amazing. I'm going to freeze most of them so I have great tomato flavors all winter. And I'm off to the farmstand to buy a lot more tomatoes. This recipe was good, but I thought it was too strongly flavored of mushroom. I know, I know. That's what you want, but it was too overwhelming. Even the smell was too overwhelming. I like the idea, but maybe half of the porcini? The dough is really remarkable. It has a smoothness and workability that makes it a pleasure to stretch and even more pleasing to eat. ...baking the pasta in parchment allows the winey, clammy sauce to really soak into the pasta. And when you dig into your individual pasta packet, it's worth it alone for the incredible aroma. ...a lush ragu is made with minced chicken livers, sweet melted onions, and leaves of sage. Loosened with butter... the ragu coats the rigatoni in a way that's rich and wholly satisfying. By taking an already incredibly flavorful cut like lamb shoulder and giving it a three-day brine with rosemary and garlic, the end result is nothing short of mind-blowing. So simple but so good, this fennel cooks down to sweet, spicy, salty goodness making for a side that is poised to take center stage. Swordfish and pasta? Not the most common pairing but a brilliant one. Seriously, give it a shot. Extraordinary Meals from Ordinary Ingredients: 919 Fabulously Fast and Frugal Recipes, Each with a Secret Ingredient! A Man a Can a Plan: 50 Great Guy Meals Even You Can Make! A Man, a Can, a Plan: 50 Great Guy Meals Even You Can Make!